Explore Eastern Texas Panhandle History! River Valley Pioneer Museum, Canadian, TXCanadian's River Valley Pioneer Museum offers historic interpretation of the settlement period in the eastern Texas Panhandle. We have permanent exhibits as well as rotating exhibits from a variety of collections. From Spanish conquistadores and Indian battles to railroads and oil booms, Hemphill County, Texas, has seen it all. Located in the northeast Panhandle, Hemphill County is a land of sage-covered sand hills and rolling breaks, with towering buttes and deep canyons cut by the Canadian River. It is a place once inhabited by the ancient mammoth and mastodon and, more recently, thundering herds of bison. Hemphill County has a rich human history too. It was home to the Kiowa, Comanche, and Cheyenne and was crossed by Coronado’s famous expedition in 1540. American Indian fights, such as the Battle of Buffalo Wallow, also occurred here. Canadian, the county seat, has a history of its own. This oasis located on the banks of the Canadian River was the site of the first rodeo in Texas and a stop on the Santa Fe Railway. Other commerce soon followed, including a successful ranching and farming culture, as well as many thriving oil and natural gas industries. So, come by and experience our history--it's alive and kicking! Commerce & Trade History, Canadian TXDead people had to be buried. Sick people had to be tended. People with money needed banks and people with legal problems needed attorneys to do the paperwork and argue at the bar. The men and women who performed the various trades of 19th and 20th Century Canadian were, in many respects, the core around which community commerce was built. The River Valley Pioneer Museum has a number of authentic exhibits that show the tools, goods, and services provided by bankers, doctors, mercantile shopkeepers, and undertakers. Time spent pouring over these exhibits will impress you with how far we've progressed, but also with how deeply our lives are still intertwined with the services of medicine, finance, and consumer goods. Rodeo HistoryJ. Ellison Carrol of Big Lake, Texas, is responsible for the statement that the first rodeo held in Texas was at Canadian in the summer of 1888. It was in the form of a two day celebration, with steer roping as the main event. To Hemphill County belongs the distinction of innovating a rodeo and was among the first of such “reunions” to be staged as a community undertaking anywhere in the southwest. Railroad HistoryA History of Hemphill County and the City of Canadian is the story of the railroad in the Texas Panhandle. H.Y. Wilson engineered the first train, engine 299, into Canadian, thus beginning a way of life which would effect the city of Canadian for more than 50 years. With the railroad came the Depot, Harvey House, Roundhouse, Santa Fe Reading Room, and a population of citizens. Texas HistoryIf Canadian has anything it is the determined women who built the community. Discover some of the fascinating women who nurtured, educated, served and built the communities of the Texas Panhandle. From the first educator to the entrepreneurial women who settled and built a lasting community nestled in the corner of the Texas Panhandle, you will discover the strength and foresight that has helped keep the city of Canadian and the county of Hemphill a vibrant and treasured place in which to work, live and raise families. Hemphill CountyThe two World Wars, the Korean conflict and the Viet Nam era all had an impact on Hemphill County as was true all across the nation. Some nineteen men, early settlers, were veterans of the Civil War or Spanish American War having come here for a new start. Both the North and South were represented in this early migration. Canadian TexasExplore the rich academic history of Canadian Texas. From Mary Brainard Isaacs, Canadian's pioneer educator to Billy Cross, Educator and former Professional Halfback for the Chicago Cardinals you will discover how much of Canadian's rich heritage is rooted in academic excellence. Consider becoming a member of the Canadian River Valley Pioneer Museum. It's easy, fast, secure and tax deductable! Keep up with the latest news and exhibitions at River Valley Pioneer Museum. Subscribe today! 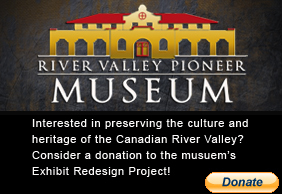 Consider donating to the River Valley Pioneer Museum's Exhibit Redesign Project. It's easy, fast, secure and tax deductable!